There is something beautiful, and yet completely ordinary, in home kitchens. No other room in a house is so lived in, so full of everyday energy. I’ve always loved how kitchens anchor a household, how people gather in the center and give it warmth. Whenever I am given an opportunity to learn from someone in their home kitchen, I feel very lucky. 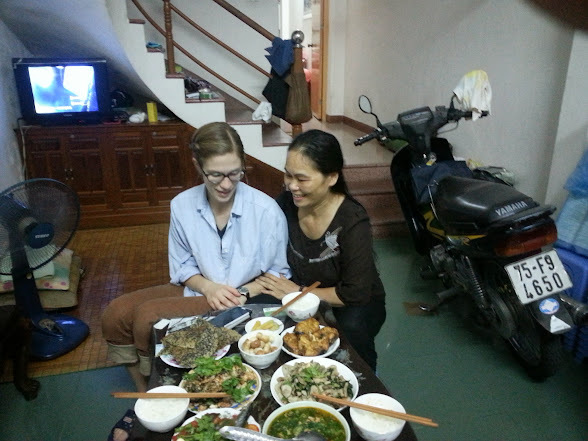 A few days ago, I cooked with a new friend’s mother, Lien, in her home. Her kitchen had that same lived-in feeling that I associate with the warm, kind families in my life. Though we didn’t share a common language, I find that cooking often doesn’t require a translator (though, I must admit, a few ingredients remain absolute mysteries to me). Everyone has their own rhythm in preparations, and Lien was a purposeful and skilled cook. Throughout the preparations, she always made sure to pause and confirm that I was following her- how she separated the crab meat for broth, how the soup looked the moment she took it off the heat, when to add each ingredient and how much seasoning. The much-spoken of “bitter mushrooms”, which are only available in a certain season with certain weather in Hue. These are an ingredient that only experienced chefs would use. Cooks like Lien have a rhythm to their cooking that is so patient and calm, speaking to years of experience. I was so happy to be able to spend the afternoon with her and share the joy of preparing a meal. Closeup of the crab soup, with shallots, coconut oil, and many different types of green herbs (most start with rau)- these flavors were so completely new to me, I had no words to describe them! As her son put it, Lien is always cooking “like for a football team”. It was true- I couldn’t believe how much food we had cooked and shared. I joked that I wished that I had two stomachs, so that I could finish dinner. She smiled, and then slyly gave me a bag of still-steaming bánh nậm to take home. Lien and I, her proud of her meal, and me still in awe at what we just created.